The days of an Amazon drone or a self-driving robot from Starship Technologies delivering goods to a buyer’s doorstep are just around the corner. But how quickly the majority of shopping will move online is still up for debate. In fact, a recent report from Intel says that according to accounting firm EY, in the next three years online shopping will only account for 19 percent of transactions, the majority of purchases will still be made in brick and mortar shops. This means that brick-and-mortar is here to stay, as least in the near term. But as brands close thousands of locations across the country, the retailers of the future are designing a new breed of store. The new generation of digital natives doesn’t want to browse dusty shelves in search of their purchases. The millennial shopper wants a smart store, one that caters to people accustomed to online shopping. Some brands have already taken bold steps to attract millennials, such as introducing brainwave-reading devices to match customers to products. One innovator in this area is Japanese clothing store Uniqlo, who used technology originally developed for scientific research to pilot a unique in-store experience for its shoppers. 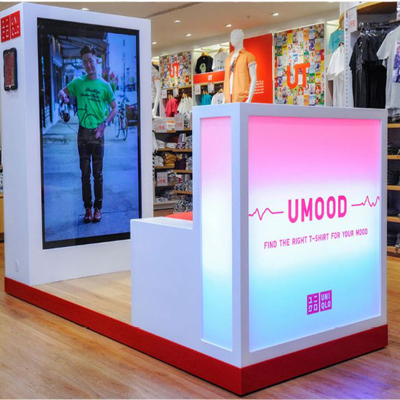 The company built several UMood booths for its Australia stores, where shoppers could step in and see a series of t-shirts. Using artificial intelligence that can measure a reaction to a color or style, the UMood booth helps the buyer pick a shirt based on his or her emotional reaction to the product images. The UMood technology, developed in collaboration with Melbourne University, uses a dose of neuroscience. The Uniqlo customer in the booth is fitted with a neuro-headset and shown a series of video stimuli, while their neurological responses (including stress, concentration and drowsiness) are analyzed in real time by a custom-built algorithm that identifies their current mood. According to the company, by analyzing the data the UMood booth “is able to recommend the perfect t-shirt” for each customer. Uniqlo didn’t stop with AI technology to enhance the shopping experience—it also came up with a 21st century vending machine, the Uniqlo To Go kiosk. Any retail manager knows that the two biggest costs for stores are real estate and labor. If a store can eliminate one and reduce the other, the results can be astounding. Having vending machines instead of—or in addition to—expensive storefronts can save thousands in payroll and move more product. Vending machines can operate 24/7, 365 days a year, making them an in-person rival to the convenience of online shopping. Uniqlo intends to have 10 technology-enabled kiosks selling clothes in operation in airports and shopping malls in Oakland, New York, Houston and several major U.S. cities by the end of September. The six-feet-tall machines will be covered in the company’s logo and will sell staple items, including Uniqlo’s popular heat-retaining shirts and lightweight down jackets. The items will be packaged in boxes and cans, and the buyer can return them in a store or via the mail. The first Uniqlo To Go machine went live at the Oakland International Airport in early August. Uniqlo isn’t alone in the kiosk concepts. Electronics retailer Best Buy now operates more than 200 Express™ Kiosks around the US, where it sells various electronic gadgets and accessories. As shoppers get comfortable snapping up goods from automated kiosks, several food retailers are taking a page from the retail playbook. Little Caesars is experimenting with “pizza portals” in its stores. Customers order and pay using a mobile app, which sends an alert to the user’s smartphone when the order is ready. At the shop, the customer punches in an order code to retrieve her order from an individual compartment in a pizza-warming oven. Panera has a similar system, where customers place orders in the app or at an in-store kiosk and then scoop up a bag with their name on it from a designated shelf. Independent software developers are also pitching in new ideas for in-store retail transformation. One such company, Palo Alto, CA-based Curbside, has a service that allows shoppers to select items online or through a mobile app and pick them up at a retail location in less than an hour. Its partners include Boston Market, CVS Pharmacy, Levi’s, Pizza Hut and Sephora.